MG12XU with DBR PA Package 15" Mains. 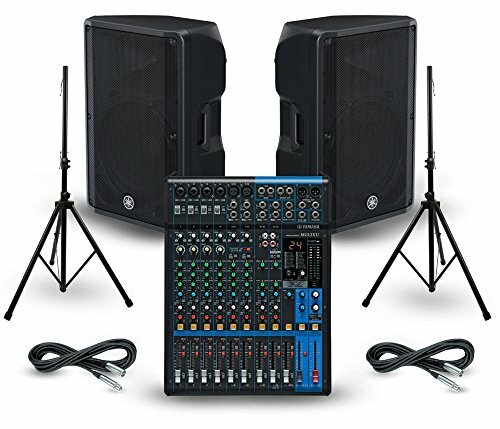 This complete PA package is available in three configurations. Each centers around the Yamaha MG12XU mixing console and is equipped with a pair of Yamaha DBR powered speakers, a pair of tripod speaker stands and a pair of XLR cables for connecting your MG12XU to your DBR Series powered speakers. The three available package configurations feature either the DBR10s, DBR12s or the DBR15s, depending on how much low end dispersion you require. This one features the DBR10s with 10 in. woofer. Yamaha MG12XU (J06371) The MG12XU boasts an intuitive interface with capacities suitable for a diverse range of users and applications. For installed, recording, or live music settings, the solid construction and flexible design of these consoles lets you shape your sound with confidence, continually delivering peak performance and a level of sound quality and reliability that has made it a leader in its class. Twelve channels, built-in FX, much more. Musician's Gear 20' Mic Cable (pair) (339877) Gear One's XLR cables have the strength and durability to withstand everyday use. Musician's Gear Tripod Speaker Stands (pair) (J01627) Steel stand finished in black, supports up to 100 pounds. Adjusts from 42 to 71 in. height. Tripod folds up for easy transport. Yamaha DBR10 (J13949) The DBR 10 features a 10" LF driver and a 1.4" ferrite HF driver with a 1" throat. It packs a powerful 700W Class D amplifier and does it all while weighing in at less than 24lbs. The cabinet is ergonomically designed for easy transport and the sound is pure Yamaha. Yamaha DBR12 (J13950) The DBR 12 features a 12" LF driver along with a 1.4" ferrite HF driver with a 1" throat. It has 1000W of Class D amplifier power and weighs less than 35lbs. Yamaha DBR15 (J13948) The DBR15 features a 15" LF driver and a 1.4" ferrite HF driver with a 1" throat. It has a 1000W Class D amplifier and weighs a very manageable 42 lbs.